Do You Want to Get Well? Part 10. 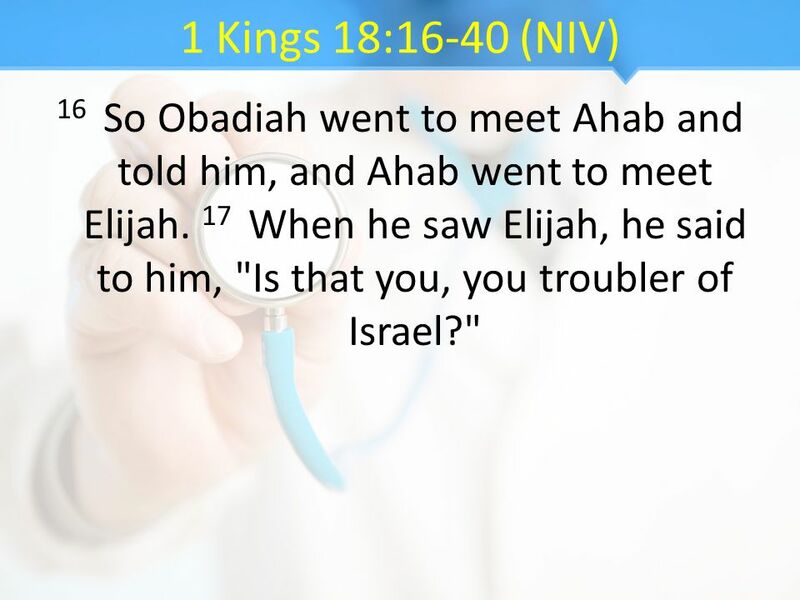 2 1 Kings 18:16-40 (NIV) 16 So Obadiah went to meet Ahab and told him, and Ahab went to meet Elijah. 17 When he saw Elijah, he said to him, "Is that you, you troubler of Israel?" 3 1 Kings 18:16-40 (NIV) 18 "I have not made trouble for Israel," Elijah replied. "But you and your father's family have. You have abandoned the LORD's commands and have followed the Baals. 4 1 Kings 18:16-40 (NIV) 19 Now summon the people from all over Israel to meet me on Mount Carmel. And bring the four hundred and fifty prophets of Baal and the four hundred prophets of Asherah, who eat at Jezebel's table." 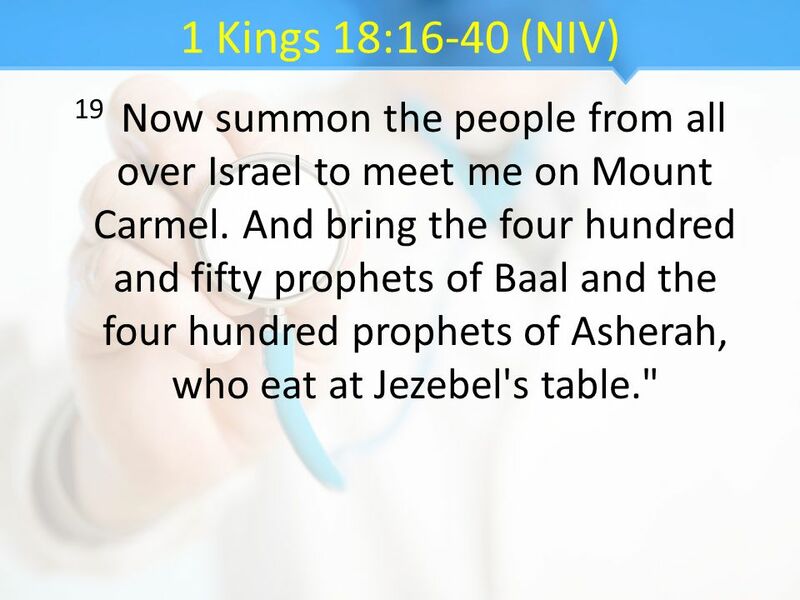 5 1 Kings 18:16-40 (NIV) 20 So Ahab sent word throughout all Israel and assembled the prophets on Mount Carmel. 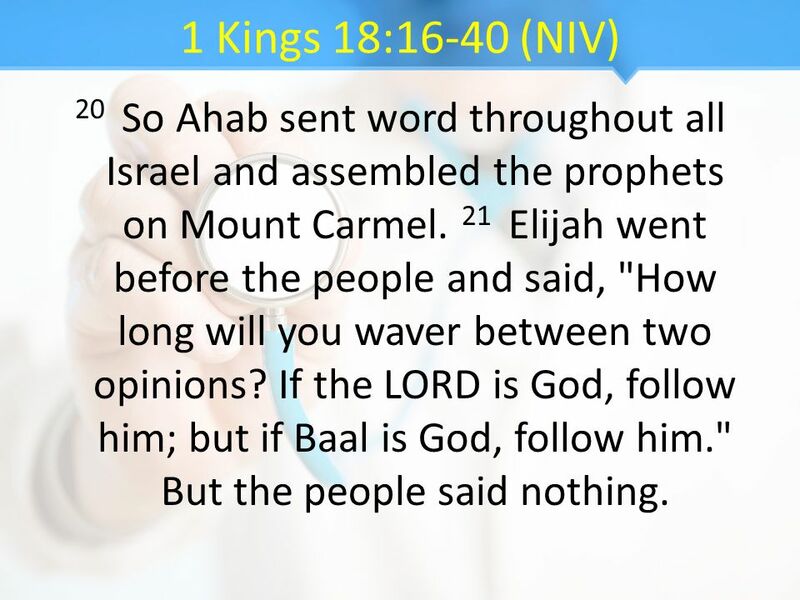 21 Elijah went before the people and said, "How long will you waver between two opinions? If the LORD is God, follow him; but if Baal is God, follow him." But the people said nothing. 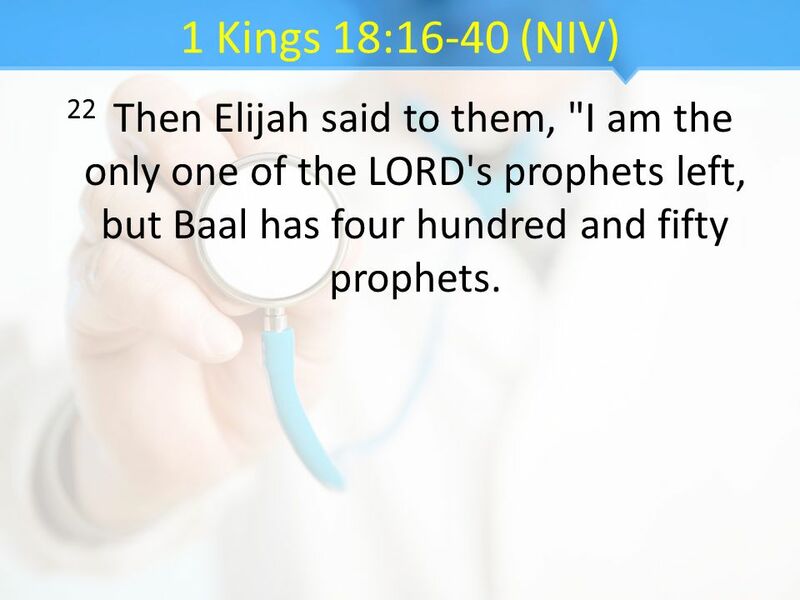 6 1 Kings 18:16-40 (NIV) 22 Then Elijah said to them, "I am the only one of the LORD's prophets left, but Baal has four hundred and fifty prophets. 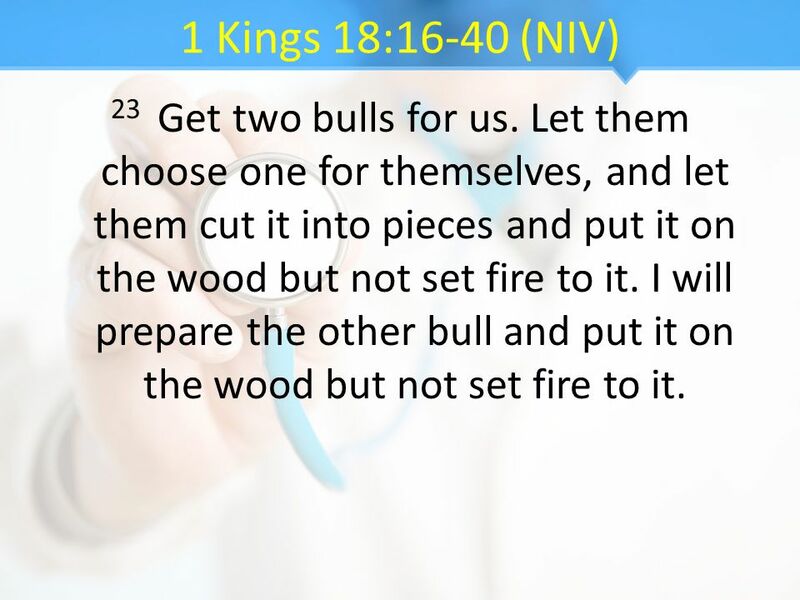 7 1 Kings 18:16-40 (NIV) 23 Get two bulls for us. Let them choose one for themselves, and let them cut it into pieces and put it on the wood but not set fire to it. I will prepare the other bull and put it on the wood but not set fire to it. 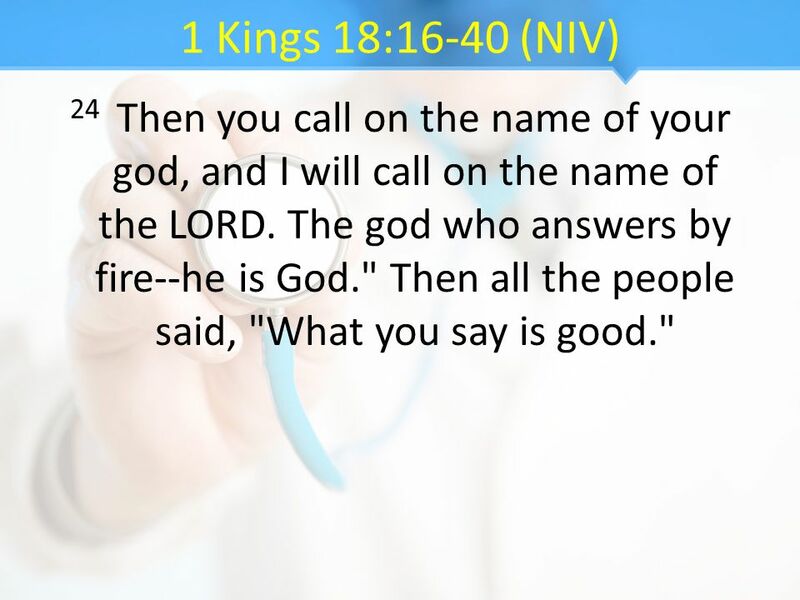 8 1 Kings 18:16-40 (NIV) 24 Then you call on the name of your god, and I will call on the name of the LORD. The god who answers by fire--he is God." Then all the people said, "What you say is good." 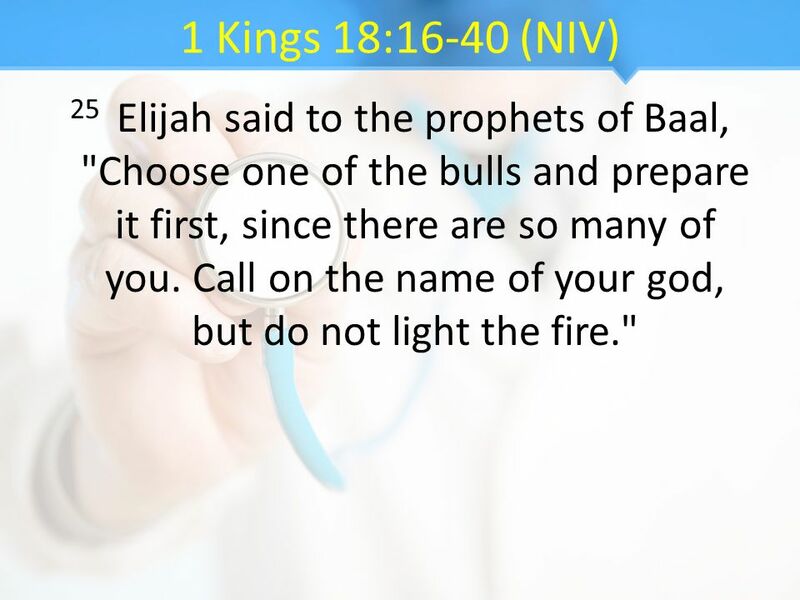 9 1 Kings 18:16-40 (NIV) 25 Elijah said to the prophets of Baal, "Choose one of the bulls and prepare it first, since there are so many of you. Call on the name of your god, but do not light the fire." 10 1 Kings 18:16-40 (NIV) 26 So they took the bull given them and prepared it. 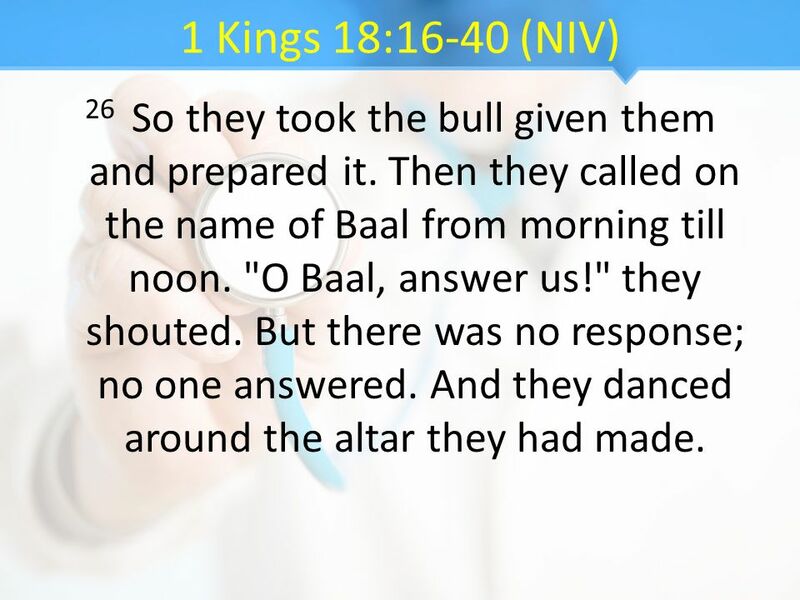 Then they called on the name of Baal from morning till noon. "O Baal, answer us!" they shouted. But there was no response; no one answered. And they danced around the altar they had made. 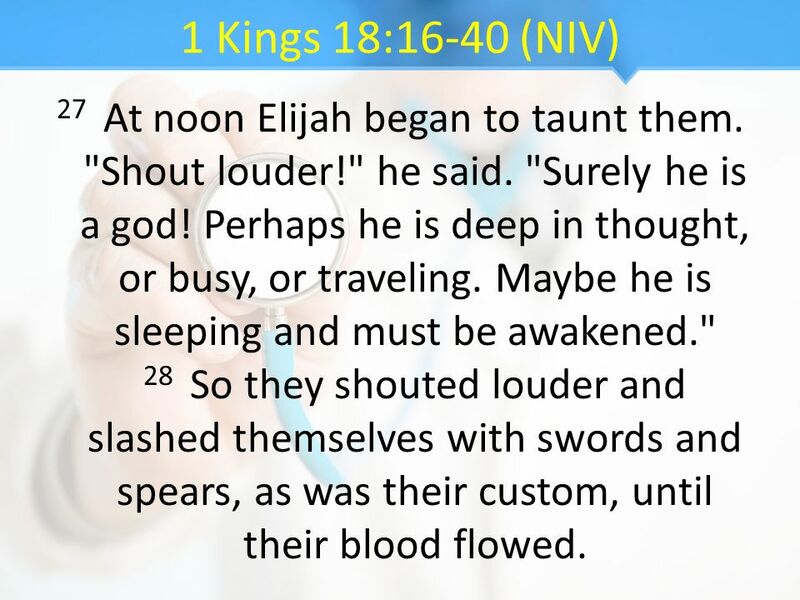 11 1 Kings 18:16-40 (NIV) 27 At noon Elijah began to taunt them. "Shout louder!" he said. "Surely he is a god! Perhaps he is deep in thought, or busy, or traveling. Maybe he is sleeping and must be awakened." 28 So they shouted louder and slashed themselves with swords and spears, as was their custom, until their blood flowed. 12 1 Kings 18:16-40 (NIV) 29 Midday passed, and they continued their frantic prophesying until the time for the evening sacrifice. But there was no response, no one answered, no one paid attention. 30 Then Elijah said to all the people, "Come here to me." 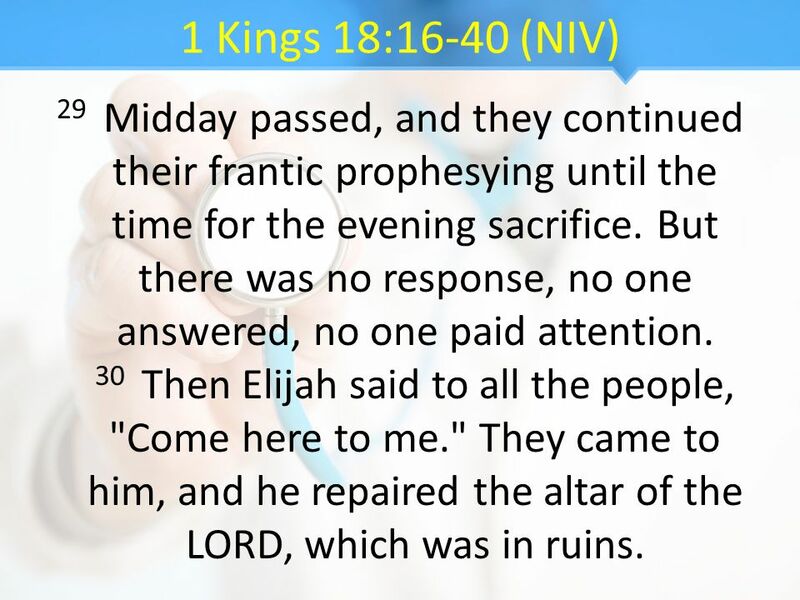 They came to him, and he repaired the altar of the LORD, which was in ruins. 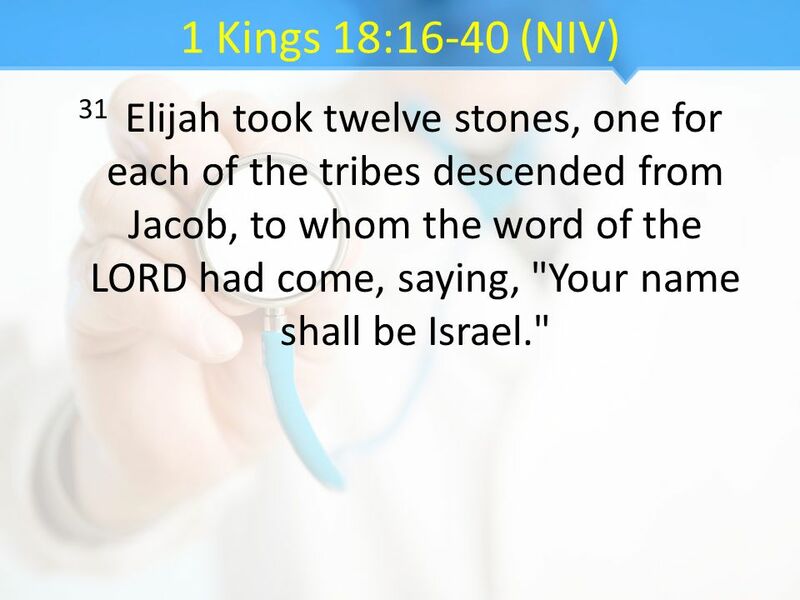 13 1 Kings 18:16-40 (NIV) 31 Elijah took twelve stones, one for each of the tribes descended from Jacob, to whom the word of the LORD had come, saying, "Your name shall be Israel." 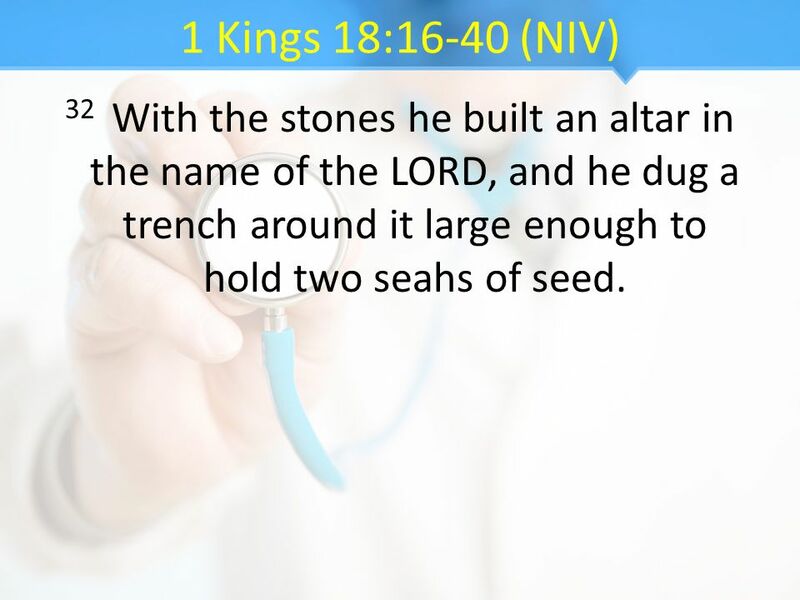 14 1 Kings 18:16-40 (NIV) 32 With the stones he built an altar in the name of the LORD, and he dug a trench around it large enough to hold two seahs of seed. 15 1 Kings 18:16-40 (NIV) 33 He arranged the wood, cut the bull into pieces and laid it on the wood. 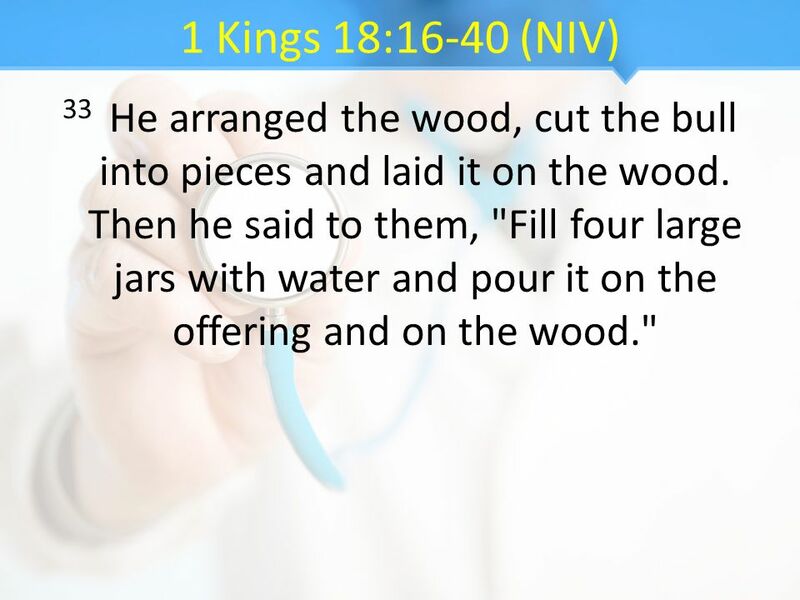 Then he said to them, "Fill four large jars with water and pour it on the offering and on the wood." 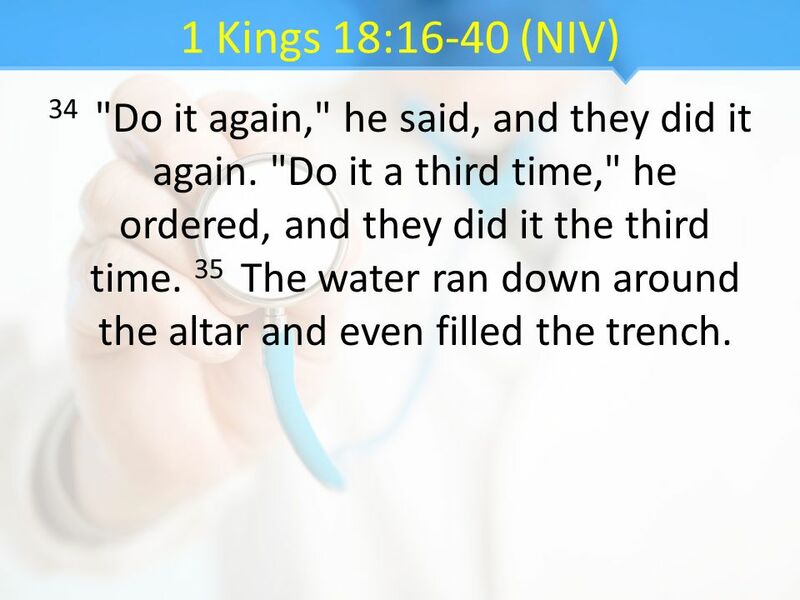 16 1 Kings 18:16-40 (NIV) 34 "Do it again," he said, and they did it again. "Do it a third time," he ordered, and they did it the third time. 35 The water ran down around the altar and even filled the trench. 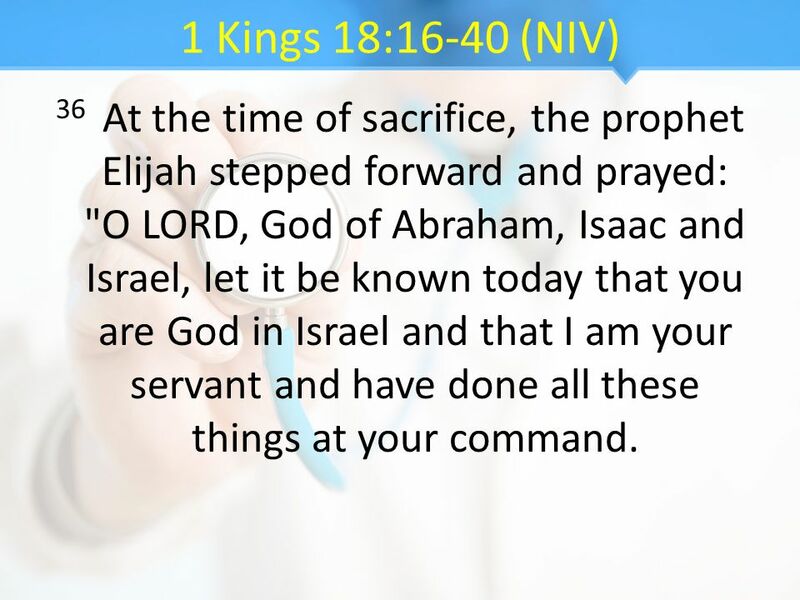 17 1 Kings 18:16-40 (NIV) 36 At the time of sacrifice, the prophet Elijah stepped forward and prayed: "O LORD, God of Abraham, Isaac and Israel, let it be known today that you are God in Israel and that I am your servant and have done all these things at your command. 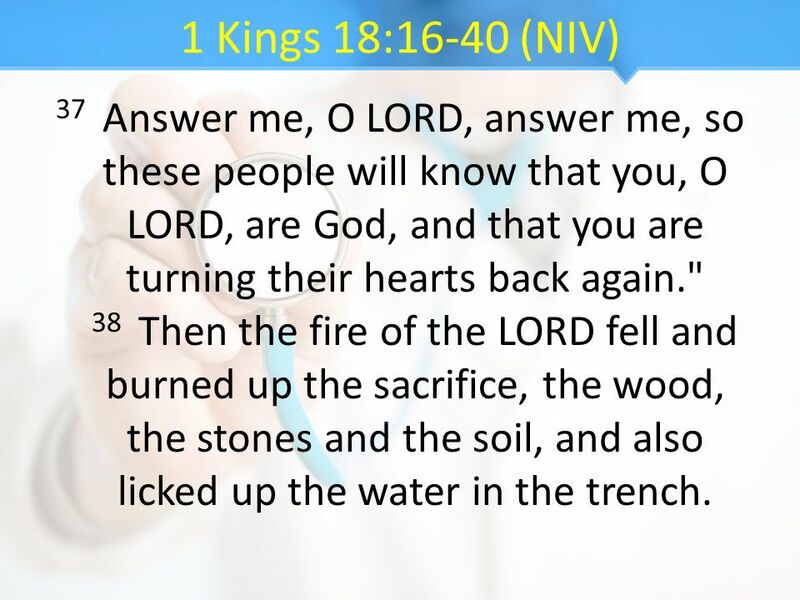 18 1 Kings 18:16-40 (NIV) 37 Answer me, O LORD, answer me, so these people will know that you, O LORD, are God, and that you are turning their hearts back again." 38 Then the fire of the LORD fell and burned up the sacrifice, the wood, the stones and the soil, and also licked up the water in the trench. 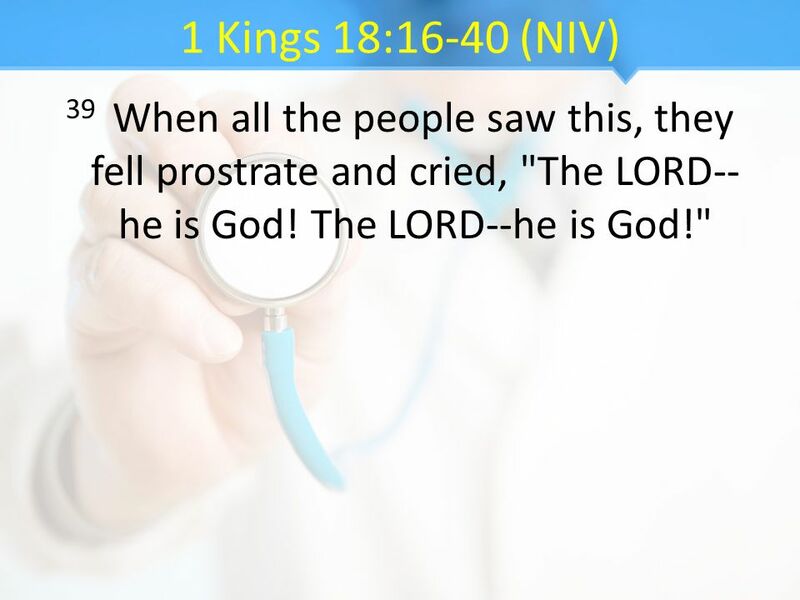 19 1 Kings 18:16-40 (NIV) 39 When all the people saw this, they fell prostrate and cried, "The LORD--he is God! The LORD--he is God!" 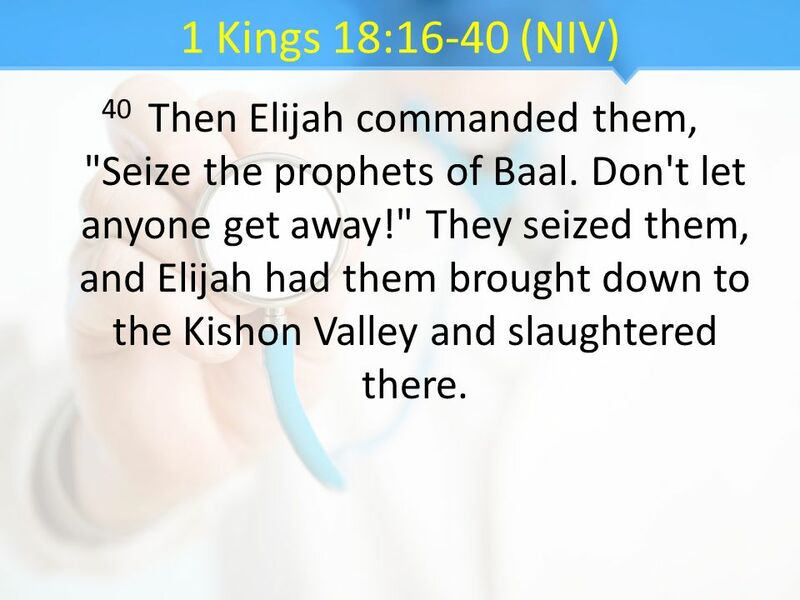 20 1 Kings 18:16-40 (NIV) 40 Then Elijah commanded them, "Seize the prophets of Baal. Don't let anyone get away!" They seized them, and Elijah had them brought down to the Kishon Valley and slaughtered there. 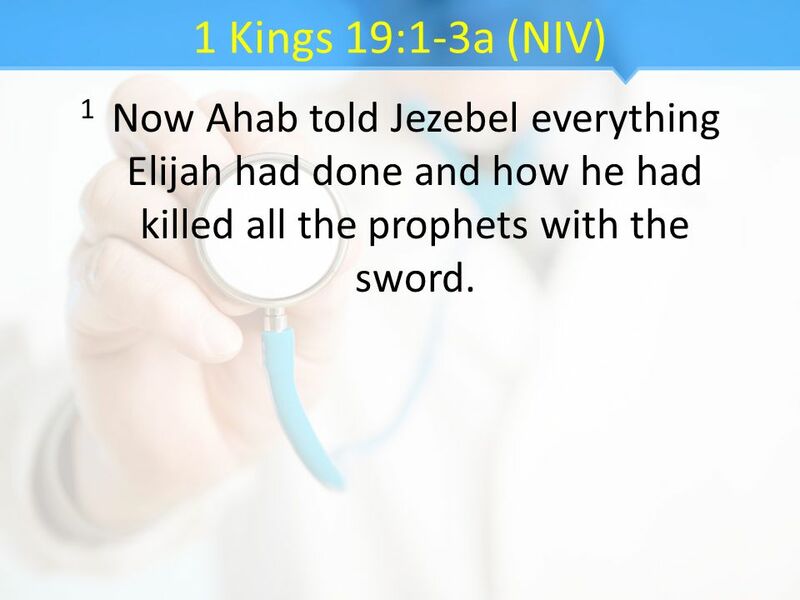 21 1 Kings 19:1-3a (NIV) 1 Now Ahab told Jezebel everything Elijah had done and how he had killed all the prophets with the sword. 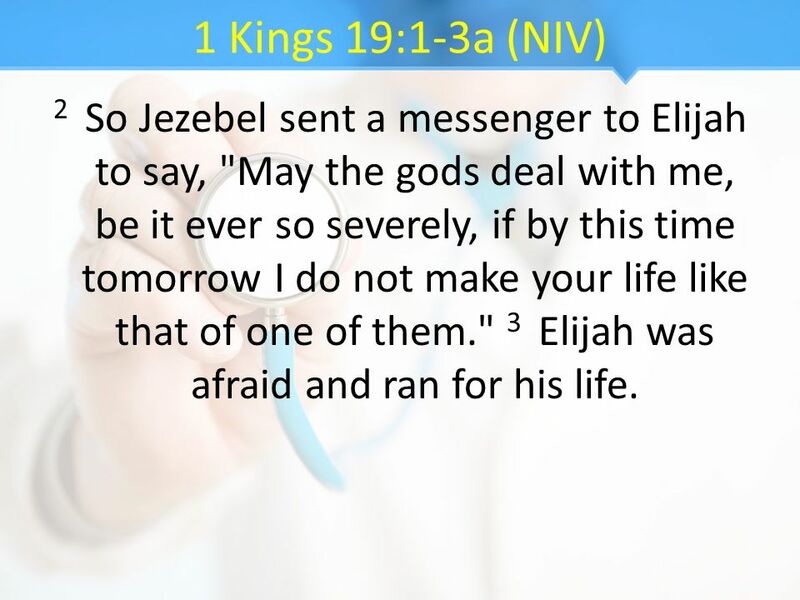 22 1 Kings 19:1-3a (NIV) 2 So Jezebel sent a messenger to Elijah to say, "May the gods deal with me, be it ever so severely, if by this time tomorrow I do not make your life like that of one of them." 3 Elijah was afraid and ran for his life. 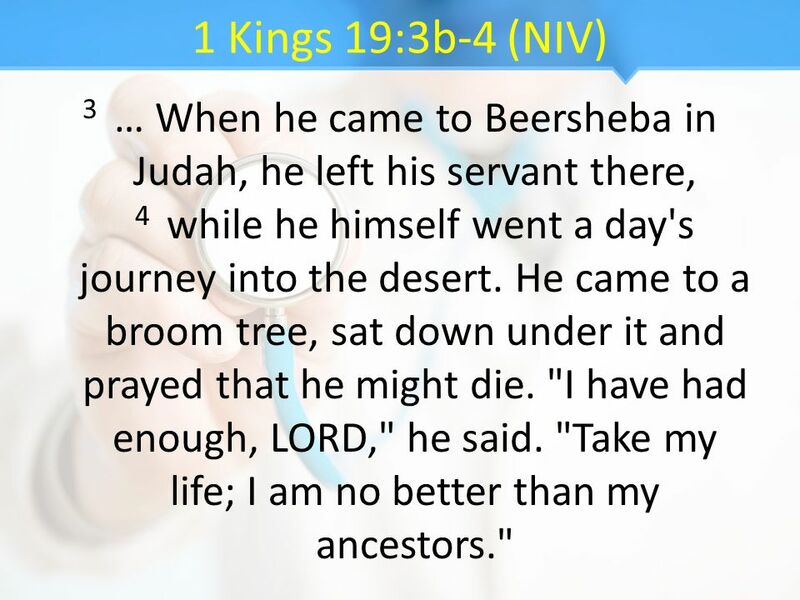 23 1 Kings 19:3b-4 (NIV) 3 … When he came to Beersheba in Judah, he left his servant there, 4 while he himself went a day's journey into the desert. He came to a broom tree, sat down under it and prayed that he might die. "I have had enough, LORD," he said. "Take my life; I am no better than my ancestors." 24 Do You Want to Get Well? 1. Short Term. 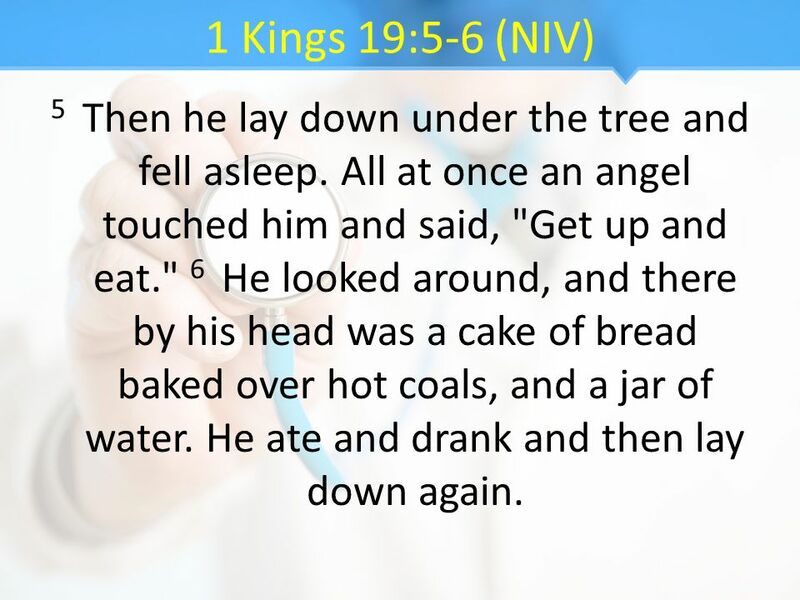 25 1 Kings 19:5-6 (NIV) 5 Then he lay down under the tree and fell asleep. All at once an angel touched him and said, "Get up and eat." 6 He looked around, and there by his head was a cake of bread baked over hot coals, and a jar of water. He ate and drank and then lay down again. 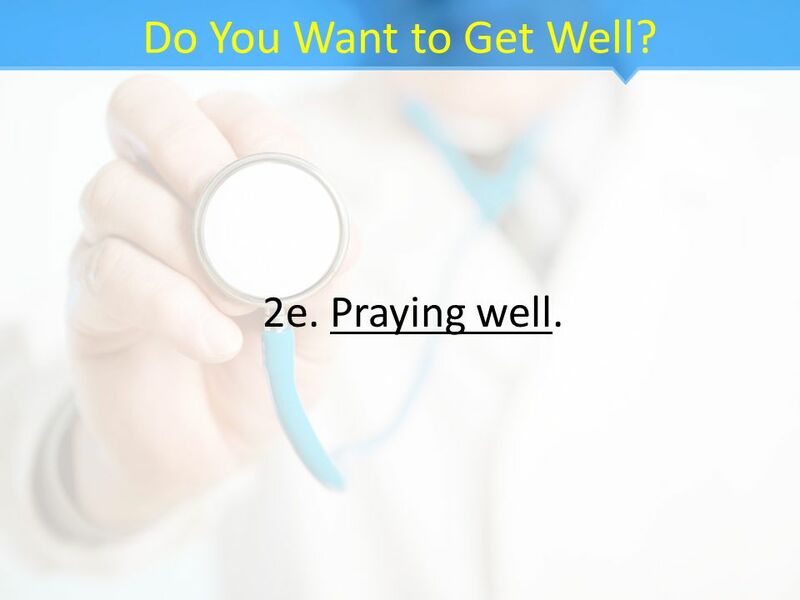 26 Do You Want to Get Well? 1a. A snack and a nap. 27 Do You Want to Get Well? 2. Long Term. 28 Do You Want to Get Well? 2a. Eating well. 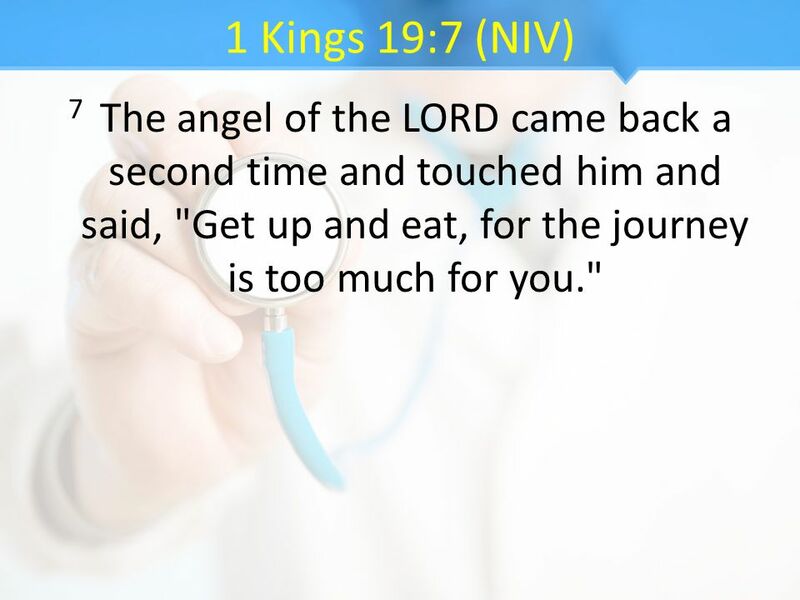 29 1 Kings 19:7 (NIV) 7 The angel of the LORD came back a second time and touched him and said, "Get up and eat, for the journey is too much for you." 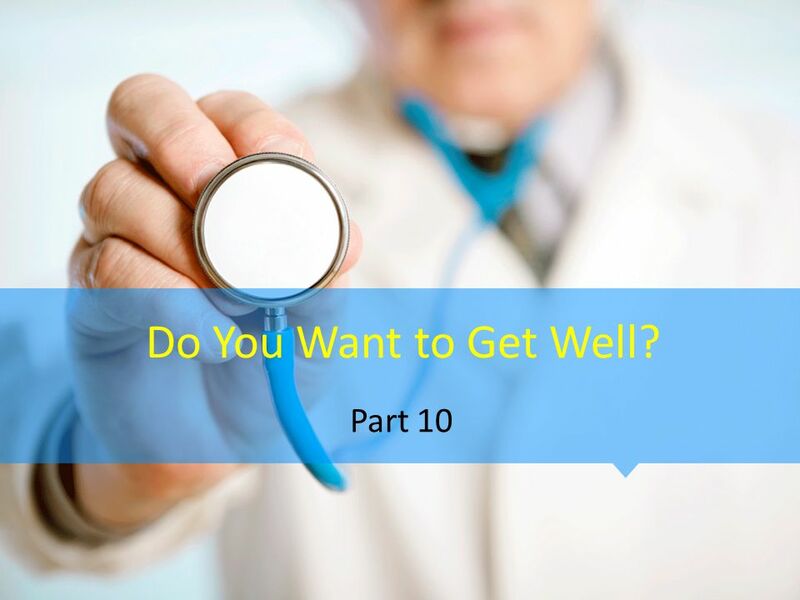 30 Do You Want to Get Well? 2b. Moving well. 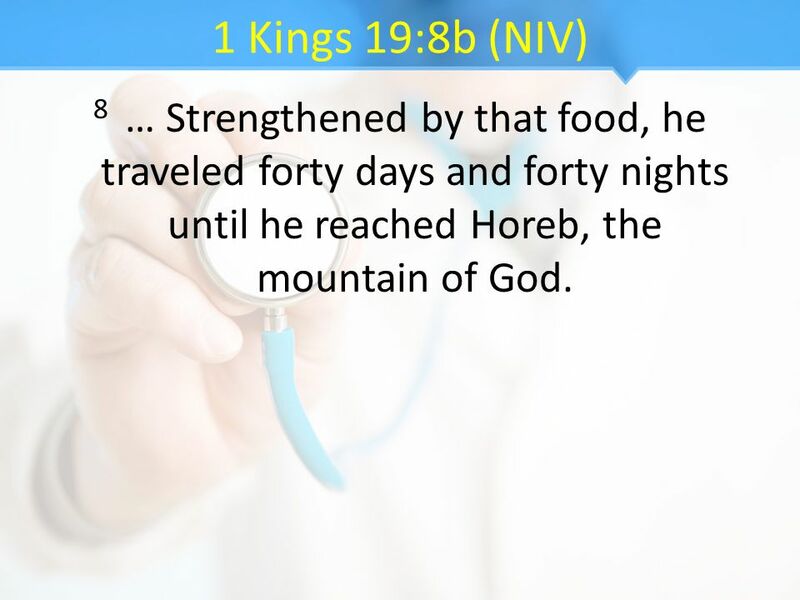 31 1 Kings 19:8b (NIV) 8 … Strengthened by that food, he traveled forty days and forty nights until he reached Horeb, the mountain of God. 32 Do You Want to Get Well? 2c. Resting well. 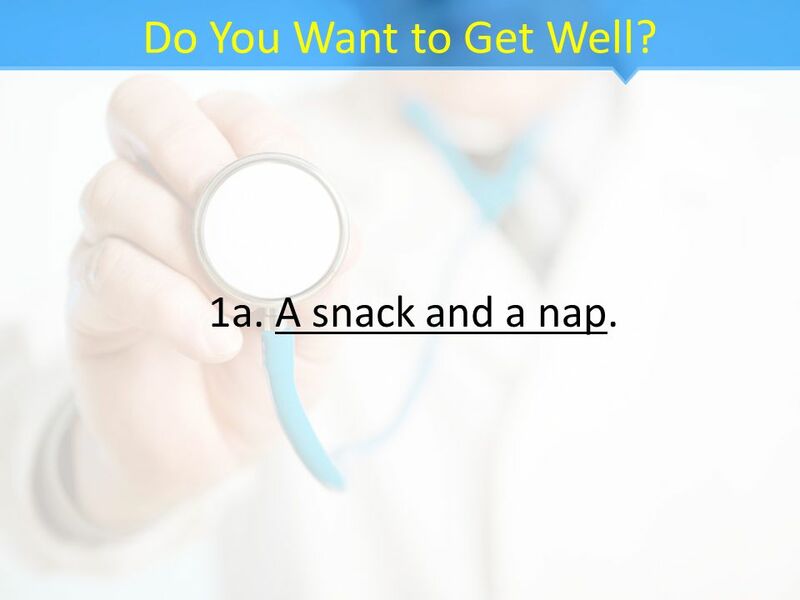 34 Do You Want to Get Well? 2d. Living well. 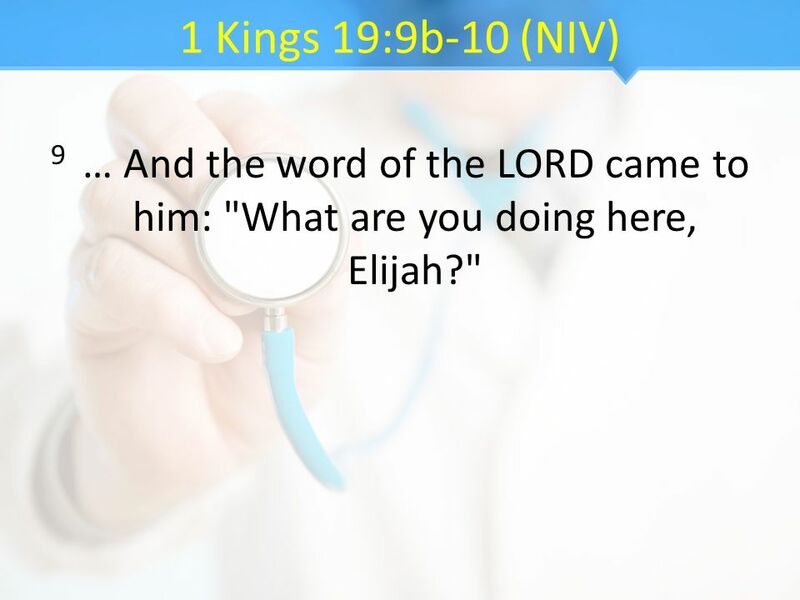 35 1 Kings 19:9b-10 (NIV) 9 … And the word of the LORD came to him: "What are you doing here, Elijah?" 36 1 Kings 19:9b-10 (NIV) 10 He replied, "I have been very zealous for the LORD God Almighty. 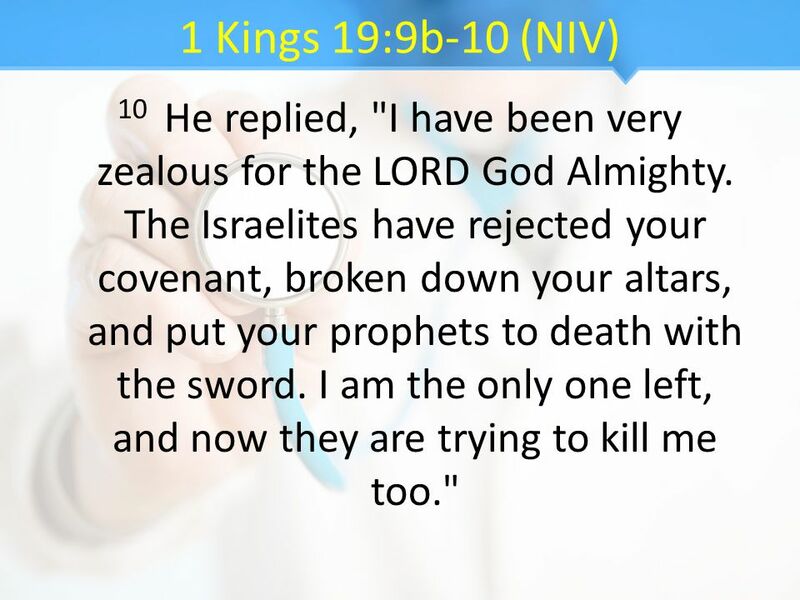 The Israelites have rejected your covenant, broken down your altars, and put your prophets to death with the sword. I am the only one left, and now they are trying to kill me too." 37 Do You Want to Get Well? 2e. Praying well. 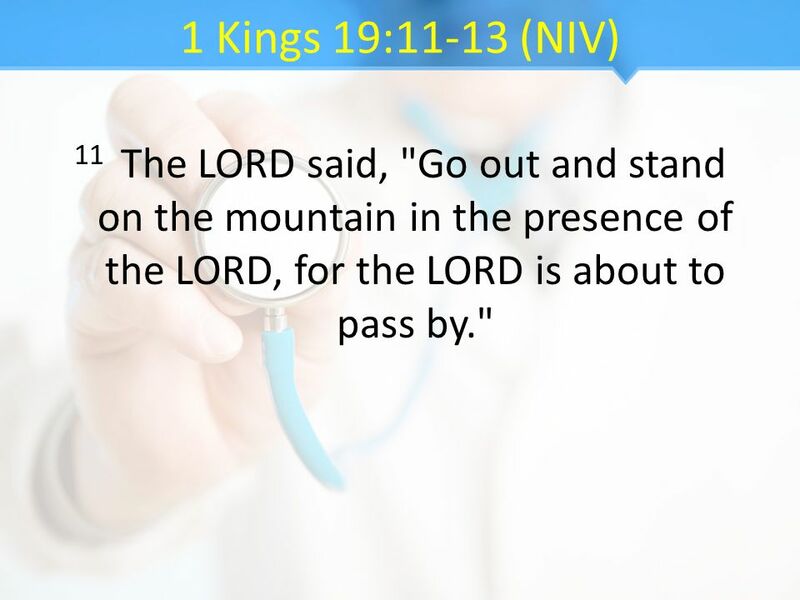 38 1 Kings 19:11-13 (NIV) 11 The LORD said, "Go out and stand on the mountain in the presence of the LORD, for the LORD is about to pass by." 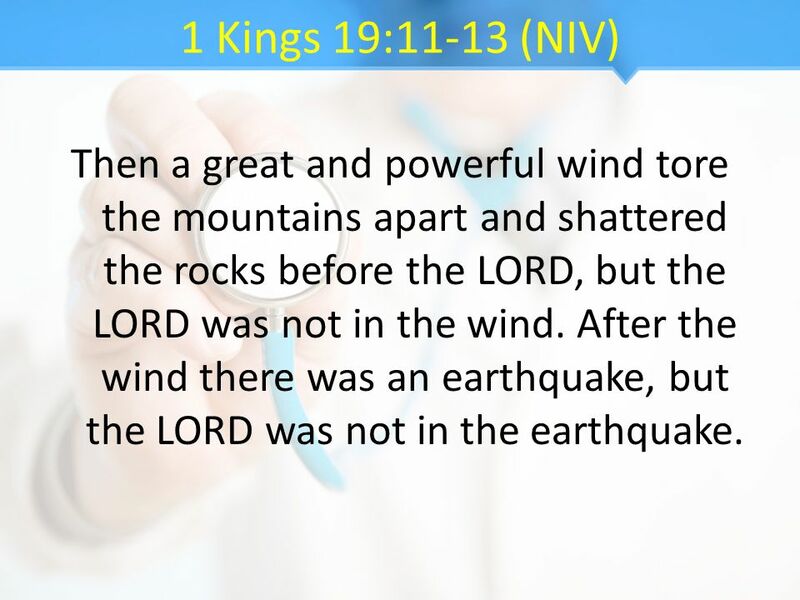 39 1 Kings 19:11-13 (NIV) Then a great and powerful wind tore the mountains apart and shattered the rocks before the LORD, but the LORD was not in the wind. After the wind there was an earthquake, but the LORD was not in the earthquake. 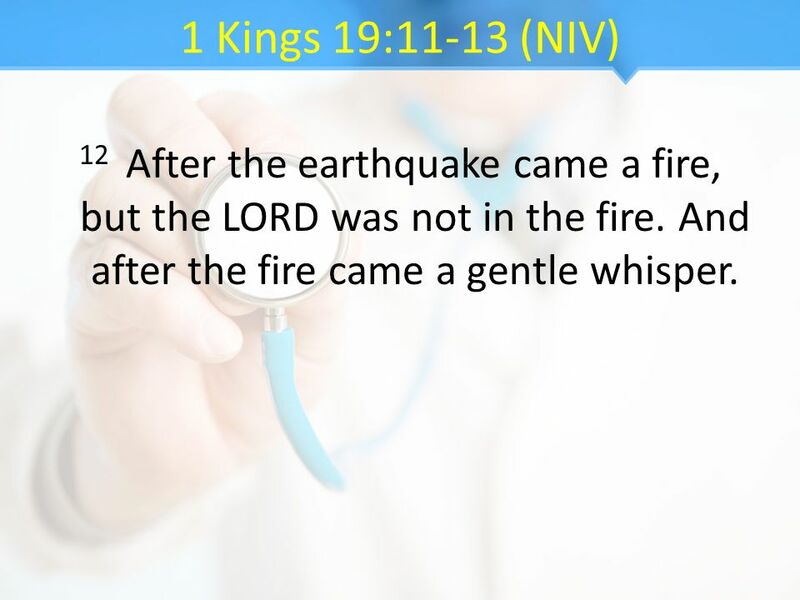 40 1 Kings 19:11-13 (NIV) 12 After the earthquake came a fire, but the LORD was not in the fire. And after the fire came a gentle whisper. 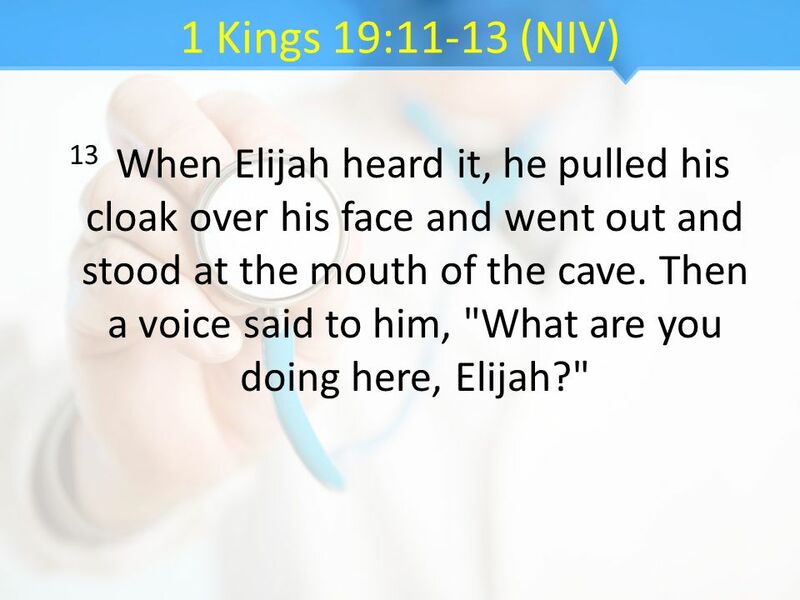 41 1 Kings 19:11-13 (NIV) 13 When Elijah heard it, he pulled his cloak over his face and went out and stood at the mouth of the cave. Then a voice said to him, "What are you doing here, Elijah?" Download ppt "Do You Want to Get Well? Part 10." 1 Naturally Supernatural Part Six. 2 John 8:12 (NIV) 12 When Jesus spoke again to the people, he said, "I am the light of the world. Whoever follows me. Back to School Prayer. God is Greater Live It Hearing from God Heart: God knows better Hands: Obey what he's already shown Feet: Put yourself in the. A Man Just Like Us Lessons in Prayer. A Man Just Like Us Lessons in Prayer. I Sam 20:1 – Who did David ask, “What have I done? What is my iniquity?” # 20-1 A. Jonathan B. Saul C. Samuel. Ministerial Association Week of Prayer The Little Whiles of Life. “I serve the LORD” November 1, 2009 Sunday School 1 st thru 6 th graders By: Jodie Hildenbrand. 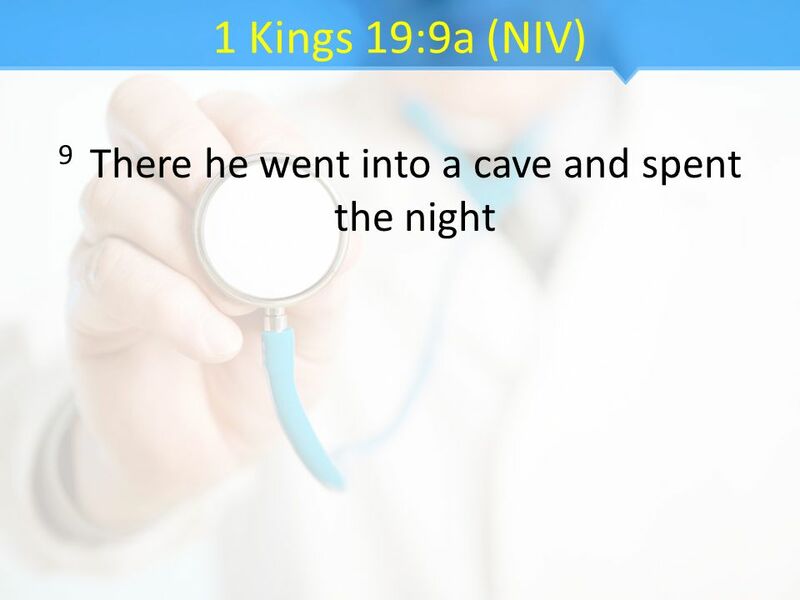 I Kings 19:1-18. 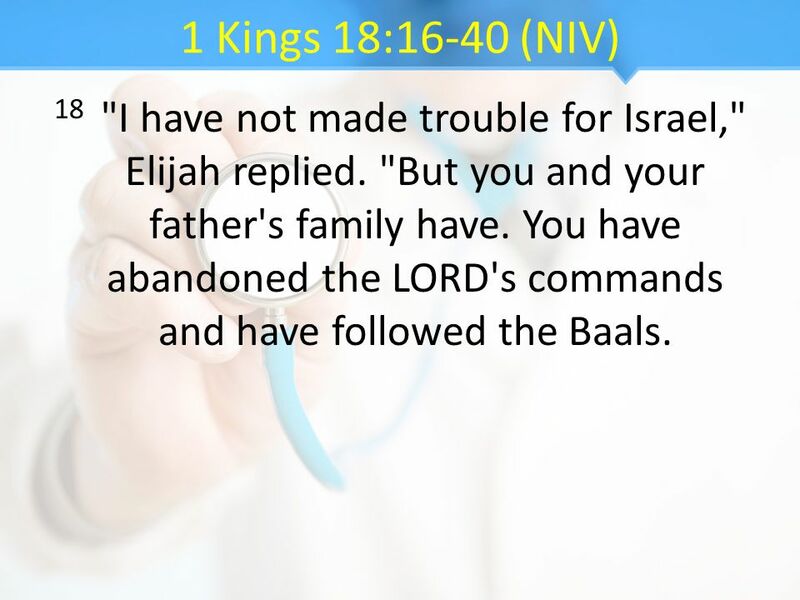 Backstory * Elijah – a prophet of God * King Ahab – evil king that leads the people of Israel to sin more than any king previous to him.  1 Corinthians 2:9  However, as it is written: “What no eye has seen, what no ear has heard, and what no human mind has conceived”— the things God has. 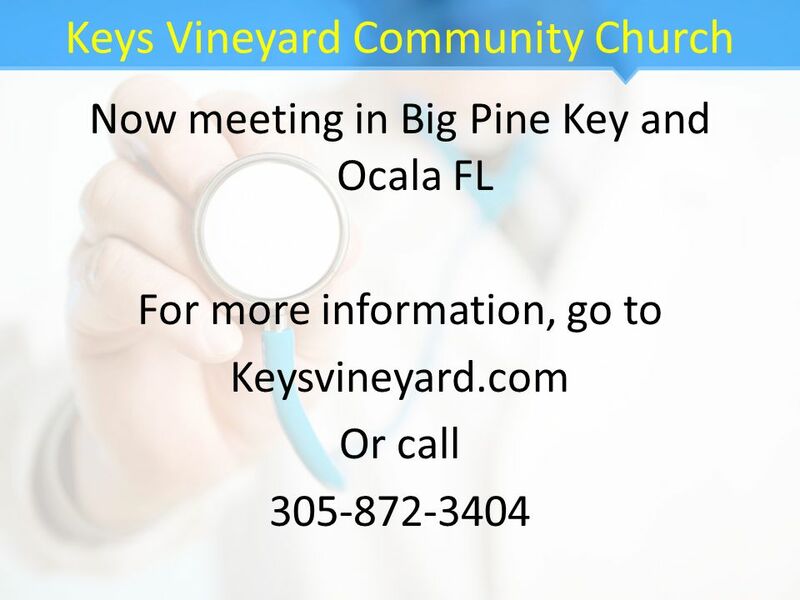 Anxiety – Anxiety disorders are the most common mental illness in the U.S., affecting 40 million adults in the United States age 18 and older (18% of.